Think back to the time of 2010-2012. We were more innocent then. Our President was competent, smartphones had existed for awhile but were still a bit of a novelty, and no one yet had ever used the name, "Becky," as an insult. Back then there was a snazzy Marvel series known as, "S.H.I.E.L.D." 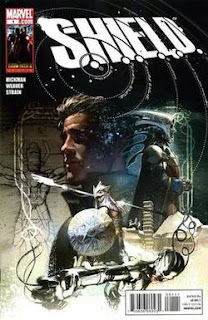 which had six issues come out, a one-shot with an infinity-logo as the numbering, and then was re-launched with a new #1, got to issue #4...and nothing. I liked what I had read and wanted more, but it looked unlikely we would ever get another issue. 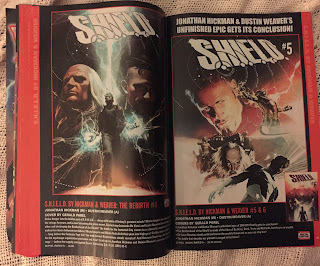 Written by Jonathan Hickman and featuring the jaw-dropping art of Dustin Weaver, it was a weird series, taking various famous real-life historical figures and claiming they were part of a secret order that was the basis of what would become, "S.H.I.E.L.D." along with other Marvel characters such as elder Starks and Richards--so no Iron Man or Fantastic Four, but their parents...or grandparents? I dunno, Marvel's shifting timelines get confusing. It was a good series and I quite liked it. Then it just kind of stopped, like a variety of comics that never are concluded seem to. Almost a year ago Jonathan Hickman claimed he had finished the script for issues #5 and #6 of the comic despite how he was leaving Marvel as an exclusive writer...but then we yet again had nothing. Imagine my surprise then when I was flipping through the latest issue of, "Previews," that came-out this past Wednesday and saw the above image greet me. I immediately asked questions such as, "Marvel is actually going to finish the damn series?" as well as, "Will this be worth the wait or turn-out like, 'The Twelve,' which I wanted to end, then hated the ending of?" plus the obvious, "Wait, I remember almost nothing from this series, will I be confused?" The first two questions can't yet be answered, but Marvel of course has the trade paperback available of the initial run of the series and will be releasing the re-launched issues #1-#4 for folk to pick-up and re-familiarize themselves with before the new issues, so that's handy for those of us who have no clue what short-box to even start digging through to find the old issues. "S.H.I.E.L.D." was a comic I remember only a little about besides how I enjoyed it. My big hope now is that I'll like reading the actual conclusion. I'm going to tell my comic shop to order me a copy of issues #5 and #6 and I look forward to reading the end of this series!